Today’s creative freelancers, to succeed, must rise above simply being a skilled artist dutifully delivering services and following orders. To step away from the pack, they must be able to run the whole project circus, transforming into project ringmasters capable not just of “taking a bite out of the elephant” but of nuking the whole damn thing. Bestselling celebrity ghostwriter and CEO of The Ink Agency, Christine Whitmarsh produces high impact books for authors, speakers, entrepreneurs, and high profile personalities. Having been the manager of hundreds of book projects over the years, she understands the demands on today’s creative entrepreneurs. Through Nuke the Elephant she will lead the way, taking you from Freelancer to Project Ringmaster of your own circus. Get Nuke the Elephant for only $0.99 and Get the special bonus offers below for free, TODAY ONLY! *After your purchase, return to this page and scroll to the bottom to get your free gifts! 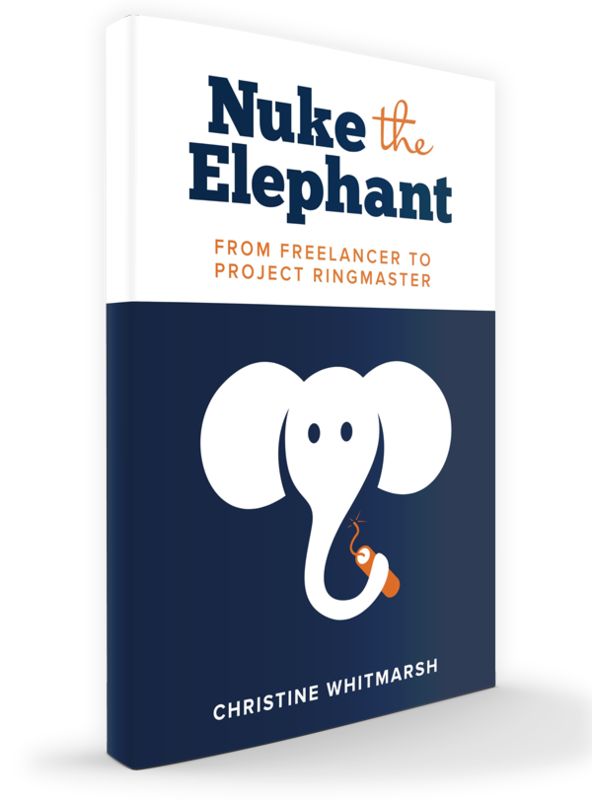 This companion workbook will take you step-by-step through the Nuke the Elephant Book and the processes within to become a project ringmaster and take control of your circus! We all know how impossible it can seem to try and control every second of the show. These tools will help you take charge and manage everything, making you the ultimate project ringmaster! WEBINAR: HOW TO STAND OUT AND GET THE BEST CLIENTS IN AN INCREASINGLY CROWDED "GIG ECOMONY"
During this hour long webinar, Christine will answer questions on how to get (and keep) the best clients, managing your team and keeping everyone in perfect harmony, fighting the inevitable fires that are a part of every creative project, and more. She will also take YOUR QUESTIONS LIVE during the webinar! This webinar will take place on Tuesday, July 17th at 1pm Eastern. You will automatically receive an email with the link prior to the webinar. See you there! Bought The book? Get your bonuses now!